I’ve been back to work for two months now, and overall it’s been great. I feel like I’m going in a good direction, career wise, and I love getting pictures of PJ and seeing what he’s doing throughout the day. The one consistent issue I’ve been having is with pumping. Some days it’s really difficult to carve out enough time to sit still and do it. And other days, well, I’m reminded that it’s very possible to be too subtle! 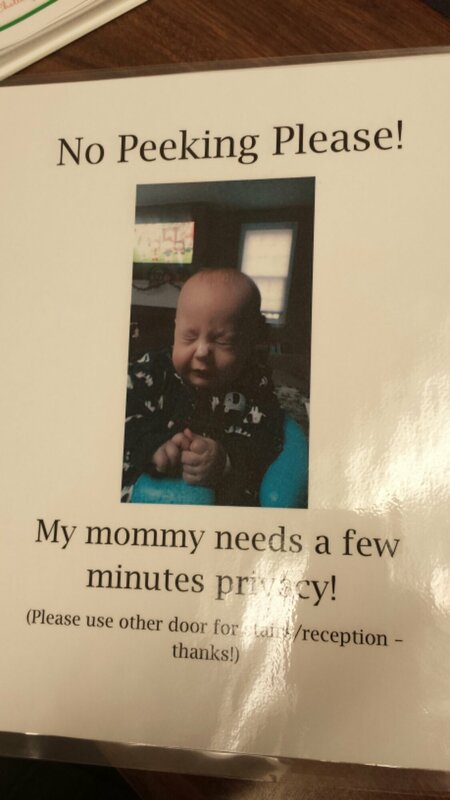 From my first day back, I printed up a sign that simply read “Please Do Not Disturb – Please use other door.” (My office sits in a weird spot that lots of people use as a shortcut). Then I will lock my door and use that Medela hands free band (that looked terrifying in the store but has since become my favorite accessory) and do my desk work while I make PJ’s lunch for the next day. And it never fails, at least once a day, someone will knock right on that Do Not Disturb sign – or worse, ignore the sign and go straight to rattling the handle! Hopefully this does the trick – a bit more direct than I wanted to get, but still better than having to yell through the door that I really, really can’t come take a look at that right now (thump thump thump). And will save my office neighbor from having to announce that for me to people who seem to be getting ready to camp out! For my other working, nursing moms – how do you handle this?